Can the study of the brain and human behavior make trade and integration policies more efficient? How can small changes in behavior trigger enormous gains in integration processes? The contributions of neuroscience to new areas of knowledge and the applications of this are attracting ever more more attention, fundamentally in connection with trade, cooperation, behavioral economics, and international negotiations. The rapid changes we are witnessing every day require a strategic vision that takes intangible factors such as human capital into account, as these are key to any negotiation. The current international trade context is dominated by an intricate set of treaties known as the Spaghetti Bowl. Moving beyond these and including positive new factors for development will require a strategic outlook that also emphasizes the intangible aspects of any negotiation. The study of behavior has helped economics make surprising advances in this regard. One of the most significant studies in the field is Camerer et al. (2005). The authors argue that the brain controls all human behavior and that economic decisions are no exception. This includes decisions on what form of integration we choose and who we trade with. Fehr and Rangel (2015) explain how the use of neuroscientists’ tools can shed light on decision-making processes and the propensity to interact and establish partnerships and strategic alliances. In a similar vein, Hsu and Yoon (2015) analyze consumer behavior from a neuroscientific perspective, linking shopping patterns to behavioral factors that have to do with attention and memory. Wong and Yazdanifard (2015) describe the importance of neuroscience as a leadership-building tool. Why Is Mental Capital Important and How Can We Foster the Development of It? Mr. Manes’s presentation focused on the importance of mental capital as a country’s main resource and source of wealth, in contrast to natural and financial resources, which he argued no longer occupied center stage. Mental capital comprises the emotional, cognitive, and social resources that a person uses to function in society, develop their potential, adapt to their surroundings, and interact with others and with the environment. He stressed that, at present, countries are categorized as being rich or poor based on the knowledge their inhabitants possess, and to possess knowledge, they must first have mental capital. Mr. Manes argued that human capital is only partly predefined by the gene pool and that the way this is expressed will depend on the interplay between biological factors and interaction with the environment. Human capital can be developed, strengthened, and built upon, but it can also deteriorate or be weakened, depending on how it is stimulated and the dynamics of the interactions between people and their social contexts. He also maintained that few people have access to this creative world that is in a constant state of flux. He mentioned the problem of malnutrition and the need to improve education in Latin America, particularly in Argentina, to open up the possibilities that children and young people have of accessing this world, which is overflowing with new technology. The factors that point to the importance of mental capital are: i) it reflects a country’s wealth in the 21st century; (ii) it determines people’s quality of life and the way they are able to contribute to society; (iii) it addresses the mental biases that limit the impact of public policies; (iv) it helps increase levels of independence and wellbeing; v) it has an impact on urgent problems such as poverty and violence. How Can We Intervene in Mental Capital? Mr. Manes discussed the research he has been working on with other scientists in Buenos Aires Province to help build mental capital among the province’s inhabitants, a project he later hopes to extend to the rest of Argentina. He argued that such interventions need to be multidimensional and include adequate nutrition, healthy surroundings, and access to high-quality education. They must intervene in a multidimensional fashion, which includes adequate nutrition, healthy surroundings, access to quality education, and the development of social and emotional stimuli. He also revealed that new programs are going to be added to those already taking place in Buenos Aires Province so as to involve all sectors of society in stimulating mental capital. He concluded by saying that mental capital needs to become a new paradigm that unites Argentines the way that democracy does. 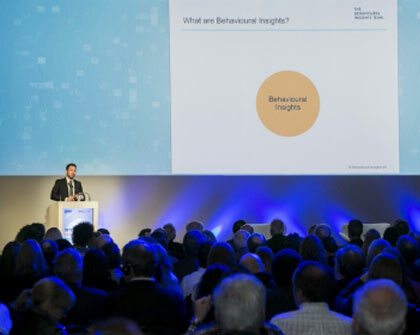 Simon Ruda discussed the application of behavioral science to public policy, that is, how the analysis of human behavior can help design better policies. Mr. Ruda is part of a team of behavioral scientists from different backgrounds who work together to create policy recommendations for different sectors of government using the knowledge of human behavior that is currently being generated. He argued that behavioral insights are the product of a combination of psychology, ethnography, behavioral economics, and public policy. Knowing how people actually act in real life helps us design better policies. This interplay between these two factors is something that is happening not just in Europe but throughout the world. He finished his presentation by giving some examples of the work that he and his team of researchers have done to help meet specific policy objectives such as: i) increasing tax revenues by getting people to make good on all debts; ii) reducing unemployment by helping people seek work more effectively; iii) ensuring that the police represents the population that it serves by increasing the success rate of applicants from a minority background; and iv) helping the police to handle telephone calls faster by reducing the number of inappropriate requests they receive. Behavioural Insights Team. 2015. Update Report. Camerer, C.; Loewenstein, G.; and Prelec, D. 2005. “Neuroeconomics: How Neuroscience Can Inform Economics.” Journal of Economic Literature. 43 (1): 9-64. Hsu, M., and Yoon, C. 2015. “The Neuroscience of Consumer Choice.” Current Opinion in Behavioral Sciences. 5 (October): 116–121. Wong Xie Zhe, J. and Yazdanifard, R. 2015. “The Neuroscience of Effective Leadership; Cultivation of a Healthy Corporate Culture through Neurochemicals.” International Journal of Management, Accounting and Economics 26 (6): 584–594.